With drastic changes on the healthcare horizon, our client recognized the need to accelerate the development of emerging leaders. To prepare for the future and navigate coming changes, it set out to strengthen its talent pipeline. 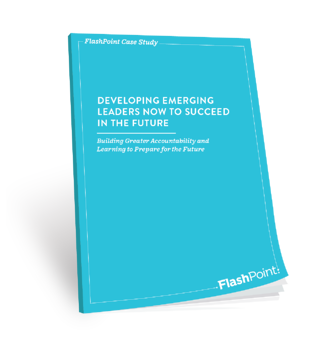 We knew FlashPoint could help and were encouraged by the executives’ commitment and buy-in. Over the years, the organization had made developing talent a business imperative, providing associates with a wide variety of flexible development opportunities, but it was time for updates and the creation of a new, robust approach to developing leaders. It was time to ready emerging leaders for their career trajectory into the company’s future. Our client is a Fortune 500 company and one of the largest health insurers in the US, providing health coverage to nearly 40 million members. Framework: FlashPoint constructed the overall program framework and designed several key components. Ongoing Support: We participated in monthly project team meetings to discuss progress to date, evaluate participant/coach feedback, and identify opportunities for enhancement. As the program evolved, we supported the continuing refinement of the tools and processes that supported the program. Program Facilitation: Over the course of the year-long experience, we facilitated discussions of books and articles, “How to Develop an IDP” webinars, and Harvard ManageMentor® online modules. Group Coaching: We coached multidisciplinary small groups of emerging leaders. Our group coaching format helped the group members come together and stay accountable to their learning and individual goals over the course of the yearlong program. Participants benefited from a shared experience where they could develop camaraderie and provide mutual support, while working toward shared goals, gaining confidence, and even coaching one another. In the first two years of the program, more than 50% of participants were promoted to career-advancing roles. The company now has a much deeper understanding of their emerging leader talent. The company has enhanced its employer brand, which has increased employee attraction and retention.